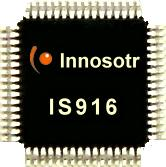 Innostor IS916D MPTool V1 software is designed to format Innostor IS916D chip controller .You can use Innostor IS916D MPTool to update Innostor Flash drive firmware and get rid off flash formatting problems .If you have Innostor IS916D USB stick ,try this recovery tool to repair your corrupted flash drive . Download Innostor IS916D format tool from the download links in the end of this article . Plug in your Innostor Flash drive into USB ports of your Computer . Open Innostor IS916D recovery tool , and if your flash drive chip controller is IS916D , you will see the flash drive details appear on the program interface . Click Start (A) to begin update your Innostor USB stick firmware . Don't disconnect your flash disk during updating process . having Lexar Juumpdrive S75 64GB not working. How can i flash it ? Which tool ? Which Firmware ? Which options ?